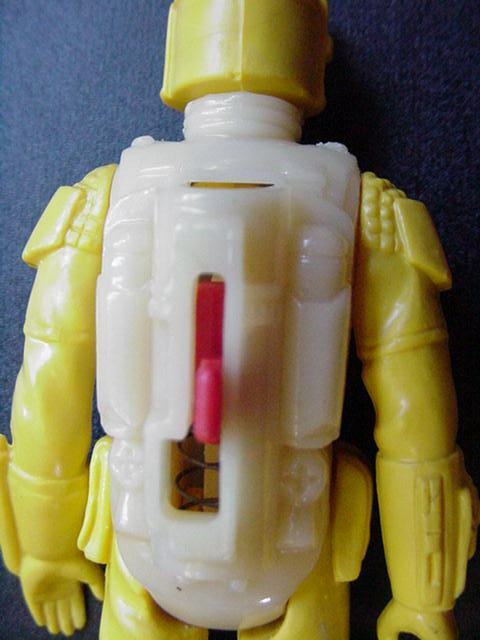 Most collectors are familiar with two different versions of Rocketfett: the notorious "L-Slot," and its later, rarer counterpart, the "J-Slot." However, at least two other types of Rocketfett have been found, one of which is shown here. The distinguishing feature of this piece is surely obvious to you--instead of the familiar blue or blue/gray colors of plastic, it has been cast in a combination of neutral (the torso) and canary-yellow colors. The odd coloration makes for quite an interesting figure, actually. Here you see a closeup of the figure's back. As you can see, the firing slot is identical to that found on the "L-Slot" figures. 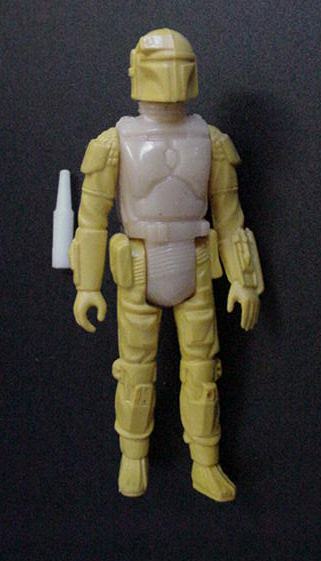 The missile that was found with the figure looks nothing at all like the red projectile developed for later Fett figures. It was probably a sort of substitute, developed some time prior to the design of the 4-sided missile sometimes found with L-Slot figures; it likely served as something by which the rocket-firing mechanism of this figure could be demonstrated. 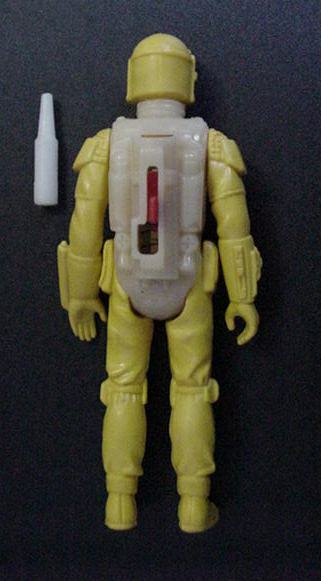 If this is true, and this white projectile can be assigned to a time prior to the production of the 4-sided missile, then it is reasonable to assume that this yellow figure predates the blue L-slot figures. I would guess that this yellow piece represents an early test of the L-Slot mold, whereas the blue pieces represent later tests, made at a time at which the 4-sided missile was already in existence.